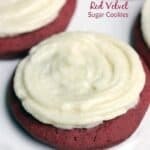 Red Velvet Sugar Cookies with cream cheese frosting is a classic cookie recipe that won’t let you down! Have you ever noticed how people go crazy for red velvet desserts at special occasions? At a wedding, for example, the red velvet cake or cupcakes is always gone in a flash! Same goes for Christmas and Valentines parties–the red velvet treats get gobbled up so fast! 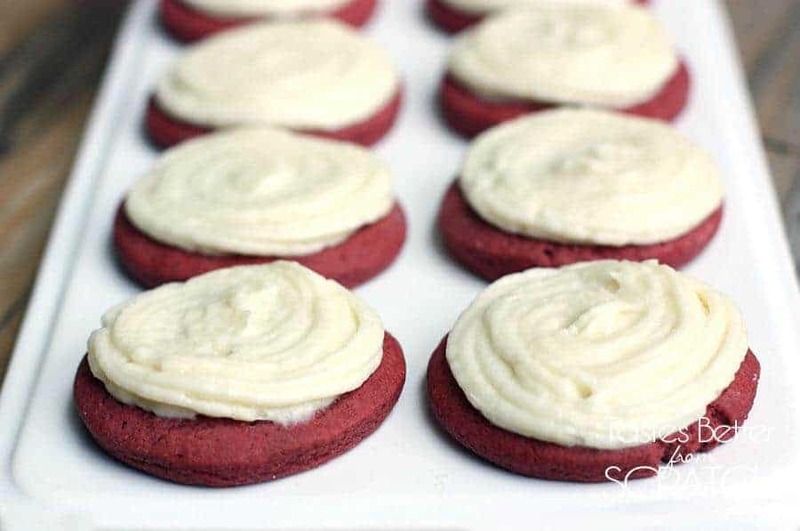 I’ve decided to embrace the craze this year with the ultimate red velvet sugar cookies with cream cheese frosting. I took my favorite Super Soft Sugar Cookie recipe and adapted the ingredients just a bit to make these yummy red velvet cookies! Then, of course, I added a simple cream cheese frosting! 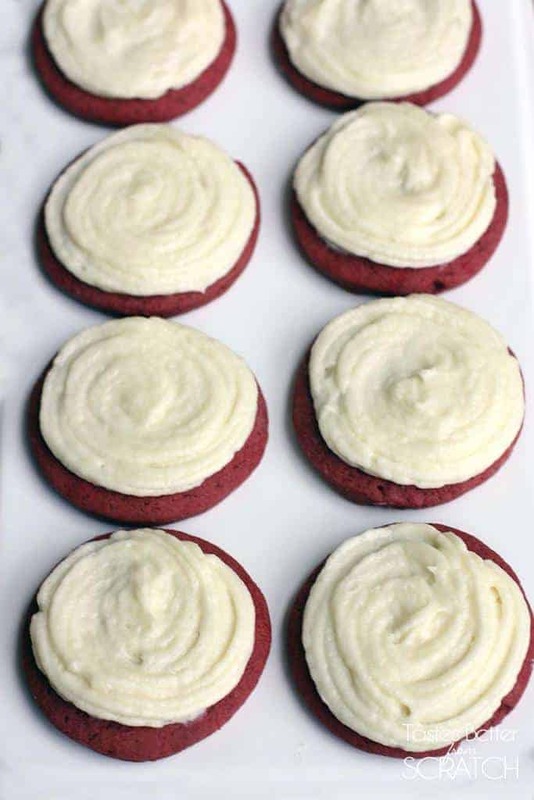 Voila–Red Velvet Sugar Cookies that will be gobbled up faster than you can make them. 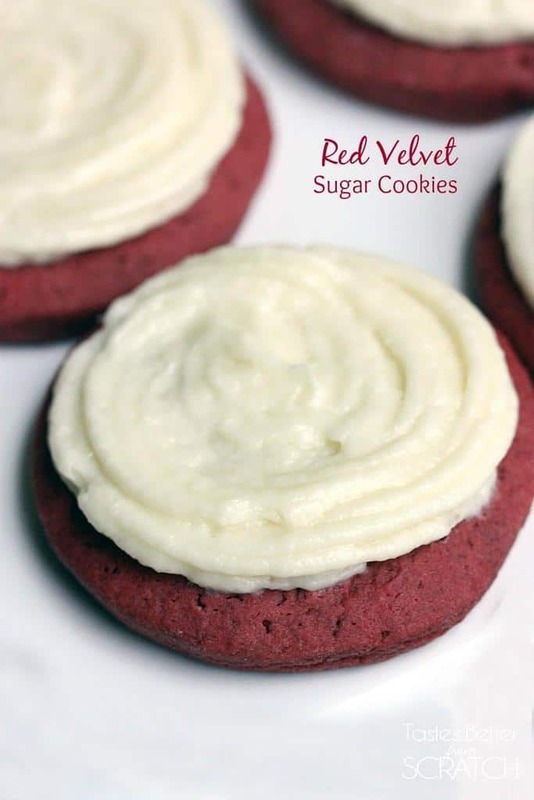 Red Velvet Sugar Cookies with cream cheese frosting is a classic cookie recipe that won't let you down! Preheat oven to 350 degrees F. In a medium size bowl, cream together shortening and sugar. Add eggs, milk, vanilla, lemon juice and food coloring and mix well. In a separate bowl, mix the dry ingredients (flour, cocoa powder, baking powder, and salt). Slowly mix dry ingredients into the wet mixture until you form a large dough ball--don't overmix. Refrigerate for 30 minutes. Bake at 350 degrees for about 8-10 minutes. Cookies should still be soft when you take them out, but not doughy. (Don’t overcook or they will be hard!) Allow to cool and frost once cooled. Cream together butter and creamy cheese until smooth and light. Add vanilla and mix. Add enough powdered sugar to reach a good frosting consistency. I love red velvet anything and these look awesome. Pinned and plan to make them for Valentine’s Day. Thanks Linda! Hope you like them! I really don’t get the whole red velvet thing. This looks like a good recipe—without the red food dye! Red food dye is synthetically derived from petroleum and can cause hypersensitivity and contribute to cancer. Who wants to eat that? I just love the color of red velvet! It’s so bright and perfectly festive! These totally look amazing, by the way. Pinned!